I moved to the final room. There, in the center of a glass case was Juanita, her hands folded and her knees bent towards her chest. 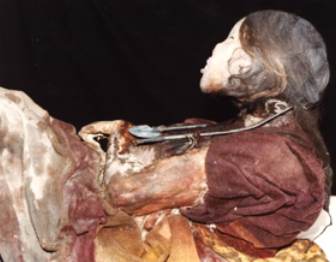 Juanita, also known as "The Ice Maiden," is a frozen 12-year-old Inca girl. She was chosen to pacify the gods of Mount Ampato near Arequipa, Peru around 1440. It was customary for the Incas to chose a child at birth to be raised as an offering to the gods. For the parents, it was the ultimate honor. For the child, it may have been less than ideal. When the Juanita -- named sixteen years ago after the anthropologist who discovered her -- was around twelve, she was dressed in her finest clothes and jewelry and led up 20,700-foot Mont Ampato to be sacrificed. Accompanying her was an entourage of priests and attendants carrying heavy clay jugs full of fermented beer, coca leaves, food and offerings for the burial site. 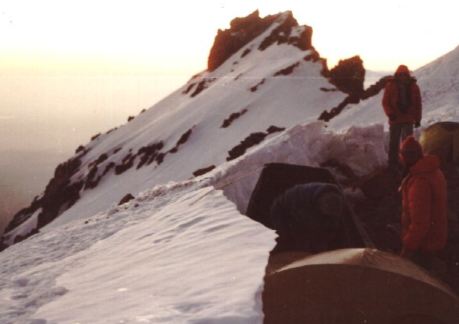 When the girl finally arrived at the summit, she was given coca leaves and beer and told to sit on a blanket. Behind her, a priest killed her by dealing a blow to the back of her head with a sharp instrument. She was then buried there along with the other funeral offerings. Had it not been for a volcano eruption, the girl's mummy might still be hidden 20,700 feet in the air, but a nearby volcano caused Mount Ampato's snowcap to melt and as a result, the entire burial site collapsed and cascaded down the mountainside. That's where anthropologist Johan Reinhard and his assistant, Miguel Zarate found the mummy bundle while on a trip up Mount Ampato. They carried the bundle down the mountain and when they opened it, they discovered not only the mummy but other offerings including pottery and miniature lamas in clay. The following year, Reinhard returned to Mount Ampato and recovered two more ice mummies, a boy and a girl. Subsequent expeditions revealed still more mummies and burial objects. To date, thirteen mummies have been discovered in the area. All thirteen mummies are rotated and displayed in a glass container at minus 20 degrees the Museo Santuarios de Altura in Arequipa. The day I went to the museum, a tour in English was just beginning. First, there was a short film that reenacted and explained the ritual. To please the gods, the Incas picked the healthiest, strongest and most attractive child. The youngster to be sacrificed was dressed in fine clothes, covered with jewels and given chica,the highly alcoholic brewed corn beer to ensure intoxication. While Juanita died from a blow to the head, other forms of killing included strangulation or being buried alive. The place of burial, called a huaca, was the sacred home for anyone living in the "other" world and contained the body, food, coca leaves, and small statues. I wandered through four dimly lit galleries whose walls were covered with huge blow-ups of the excavation process. I bent down to study the objects in the cases: there was a small yellowed handkerchief found in Juanita's pocket, her faded red and white woven shawl, and scores of miniature clay statues. 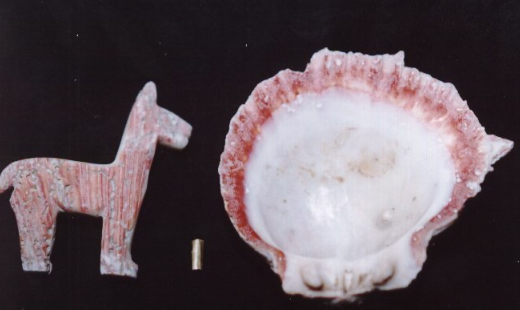 There were shells representing the sea, golden objects which signified royalty, jewelry, shawl clasps and a great deal of pottery, especially vessels for the fermented beer which the attendants carried up the mountain. I wondered how anyone could climb to 20,700 feet carrying anything that heavy, and understood why attendants died on the way up. I moved to the final room. There, in the center of a glass case was Juanita, her hands folded and her knees bent towards her chest. She had all her hair and was wearing the short-sleeved maroon garment in which she had been killed. Her skin looked leathery, but you could still see the small muscles on her arms. You could even see her fingernails. Her mouth was open revealing perfect teeth, though spaced widely apart. 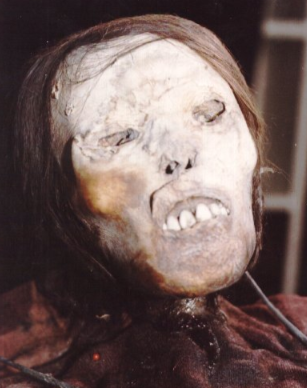 Juanita is considered the best-preserved of all the Inca mummies in the Andes. In 1996, her body was transported to the US for a CT scan, and in 1999, she was exhibited in Japan. As I stood peering through the glass case, my heart went out to this poor girl who was subjected to such a brutal end. I don't know what Juanita felt, but, as it turned out, she sacrificed herself not only for the gods of Peru but for our understanding of our human past.